The co-directors received the Washington Chapter of the Society of Professional Journalists Distinguished Service Award. The co-directors received the national Society of Professional Journalists Distinguished Teaching in Journalism Award. The project was among the finalists for the Eppy Awards. 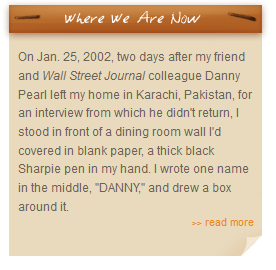 Daniel Pearl, a foreign correspondent for The Wall Street Journal, was abducted and murdered in Pakistan in 2002. His death did not go unnoticed by millions of people across the world and inspired a class at Georgetown University to investigate and report on the truth behind his murder. The Council on Foreign Relations says The Truth Left Behind is a must read. BBC World Service, Newshour, "Pearl Project Releases Findings,"
Press Club Rewind, "Asra Q. Nomani on the Pearl Project Findings," January 24, 2011. Viewers using Firefox may not be able to watch this video due to a glitch in the browser. Visit Press Club Rewind's Youtube page to watch. 2008: The co-directors received first place in the Association for Education in Journalism & Mass Communication's Best Practices in Teaching of Information Gathering Competition for their teaching methodology developed for the Pearl Project. MPS Journalism Professor Asra Nomani Appears On C-SPAN's "Q&A"
MPS Journalism Professor Asra Nomani Appears On "The World"